Seaborn excels at doing Exploratory Data Analysis (EDA) which is an important early step in any data analysis project. Seaborn uses a “dataset-oriented” API that offers a consistent way to create multiple visualizations that show the relationships between many variables. In practice, Seaborn works best when using Pandas dataframes and when the data is in tidy format. If you would like to learn more about Seaborn and how to use its functions, please consider checking out my DataCamp Course - Data Visualization with Seaborn. In my opinion the most interesting new plot is the relationship plot or relplot() function which allows you to plot with the new scatterplot() and lineplot() on data-aware grids. Prior to this release, scatter plots were shoe-horned into seaborn by using the base matplotlib function plt.scatter and were not particularly powerful. The lineplot() is replacing the tsplot() function which was not as useful as it could be. These two changes open up a lot of new possibilities for the types of EDA that are very common in Data Science/Analysis projects. 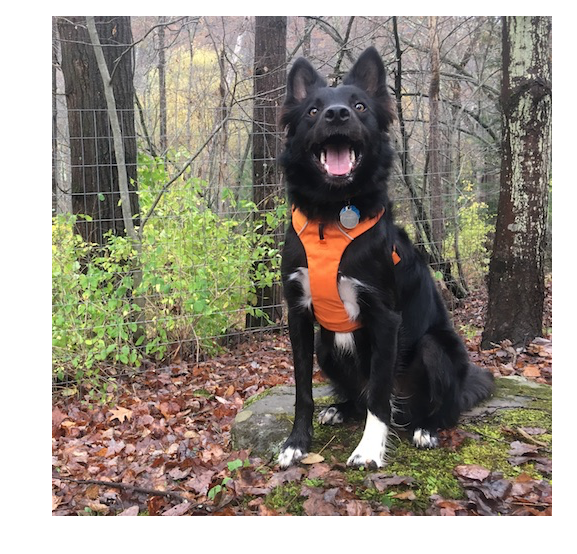 The other useful update is a brand new introduction document which very clearly lays out what Seaborn is and how to use it. In the past, one of the biggest challenges with Seaborn was figuring out how to have the “Seaborn mindset.” This introduction goes a long way towards smoothing the transition. I give big thanks to the author for taking the time to put this together. Making documentation is definitely a thankless job for a volunteer Open Source maintainer, so I want to make sure to recognize and acknolwedge this work! 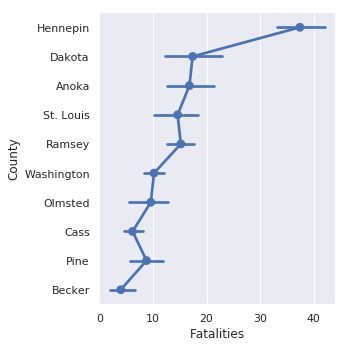 For this article, I will use a small data set showing the number of traffic fatalities by county in the state of Minnesota. 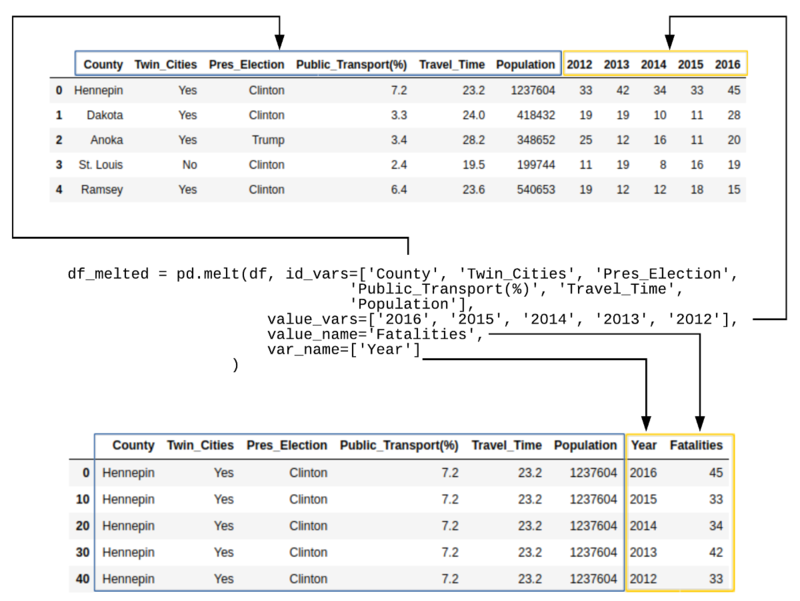 I am only including the top 10 counties and added some additional data columns that I thought might be interesting and would showcase how seaborn supports rapid visualization of different relationships. The base data was taken from the NHTSA web site and augmented with data from the MN State demographic center. Twin_Cities: The cities of Minneapolis and St. Paul are frequently combined and called the Twin Cities. As the largest metro area in the state, I thought it would be interesting to see if there were any differences across this category. 2012 - 2016: The number of traffic fatalities in that year. If you want to play with the data yourself, it’s available in the repo along with the notebook. These are the basic imports we need. Of note is that recent versions of seaborn do not automatically set the style. That’s why I explicitly use sns.set() to turn on the seaborn styles. Finally, let’s read in the CSV file from github. Before we get into using the relplot() we will show the basic usage of the scatterplot() and lineplot() and then explain how to use the more powerful relplot() to draw these types of plots across different rows and columns. For the first simple example, let’s look at the relationship between the 2016 fatalities and the average Travel_Time . In addition, let’s identify the data based on the Pres_Election column. We can use the same column name approach to alter the marker style . 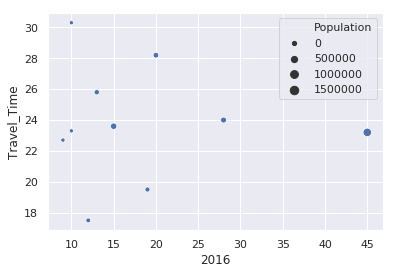 In this case, Seaborn buckets the population into 4 categories and adjusts the size of the circle based on that county’s population. A little later in the article, I will show how to adjust the size of the circles so they are larger. Before we go any further, we need to create a new data frame that contains the data in tidy format. In the original data frame, there is a column for each year that contains the relevant traffic fatality value. 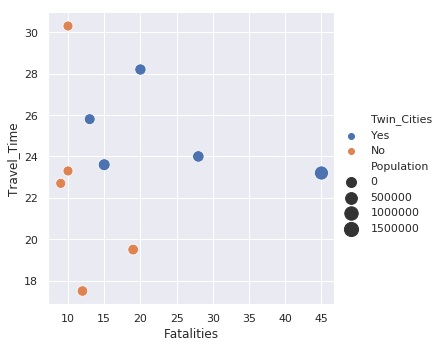 Seaborn works much better if the data is structured with the Year and Fatalities in tidy format. This illustration introduces the hue keyword which changes the color of the line based on the value in the Twin_Cities column. This plot also shows the statistical background inherent in Seaborn plots. The shaded areas are confidence intervals which basically show the range in which our true value lies. Due to the small number of samples, this interval is large. A relplot uses the base scatterplot and lineplot to build a FacetGrid. The key feature of a FacetGrid is that it supports creating multiple plots with data varying by rows and columns. This example is similar to the standard scatter plot but there is the added benefit of the legend being placed outside the plot which makes it easier to read. Additionally, I use sizes=(100,200) to scale the circles to a larger value which make them easier to view. Because the data is in tidy format, all years are included. I use the df_melted.query("Year == '2016'") code to filter only on the 2016 data. The default style for a relplot() is a scatter plot. You can use the kind='line' to use a line plot instead. This example also shows how the plots can be divided across columns using the col keyword. Once you get the data into a pandas data frame in tidy format, then you have many different options for plotting your data. Seaborn makes it very easy to look at relationships in many different ways and determine what makes the most sense for your data. In addition to the new features described above, there are some name changes to some of the functions. The biggest change is that factorplot() is now called catplot() and the default catplot() produces a stripplot() as the default plot type. The other big change is that the lvplot() is renamed to a boxenplot(). You can read more about this plot type in the documentation. Both of these changes might seem minor but names do matter. I think the term “letter-value” plot was not very widely known. Additionally, in python, category plot is a bit more intuitive than the R-terminology based factor plot. 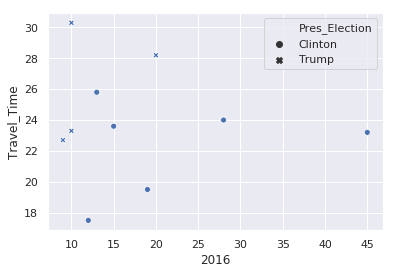 The categorical plots in seaborn are really useful. They tend to be some of my most frequently used plot types and I am always appreciative of how easy it is to quickly develop different visualizations of the data with minor code changes. There are several additional features and improvements in this latest release of seaborn. I encourage everyone to review the notes here. 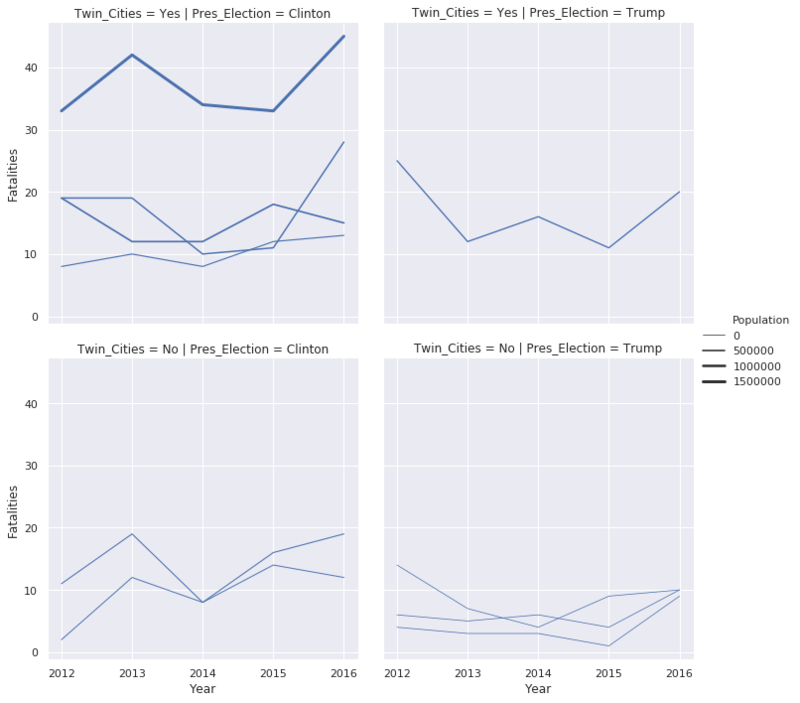 Despite all the changes to existing ones and development of new libraries in the python visualization landscape, seaborn continues to be an extremely important tool for creating beautiful statistical visualizations in python. The latest updates only improve the value of an already useful library.